A Digestive Thyroid Connection! – . The digestive tract is very important for proper thyroid hormones. 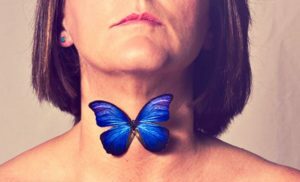 The thyroid, known for it’s butterfly shape, makes T4 which is largely inactive. A good amount of it must be converted to T3 which is many times more active and gives us energy and other benefits of thyroid function. This conversion happens in several places in the body. Around 20% of T4 is converted to T3S and T3AC in the digestive tract. These stay inactive until they circulate through the digestive tract where intestinal sulfatase turns them into active forms of T3. This is what we want to happen! The active form of T3. Because of this, many people who don’t have a healthy balance of flora have low thyroid symptoms but normal thyroid lab tests. Along with the imbalance of flora usually comes gut inflammation. This reduces active T3 too. The inflammation sets off an alarm to the body so the adrenal glands kick in and produce more cortisol to help with the stress. Pumping out more cortisol also decreases active T3. It can cause higher levels of T4 to go into the inactive form of T3. So you can see, having enough of the “good guys” is important for thyroid hormone function. Because the beneficial flora can die off for many reasons, it’s good to keep replenishing it. There are many flora products on the market but a lot of them are not viable. They are NOT all created equal! We’re happy to inform you on what really works and gives the most benefit.